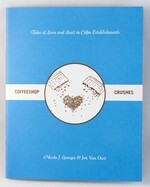 Nicole J. Georges captures her adventures and thoughts in unique, heartfelt illustrations & stories. Five years of dog mothering, chicken raising, coffee-shop crushes, drama, low paying jobs, heartbreaking romance, inspiring friendships, vegan snacks, & more! 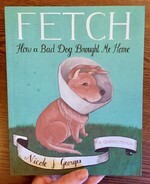 This collection will take the reader on a whirlwind tour through Nicole's personality, wit, and charm! 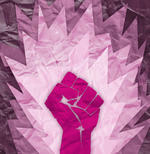 This second edition collects issues #1-8 of her zine and features 38 new, additional pages! 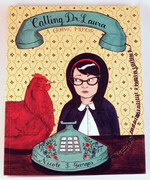 "The autobiographical comic chronicles the highs and lows of chicken raising, vegan baking, queer dating, art making and other antics, created in diary installments and collected into two anthologies for easy reading." "Her personality and wit shines through her drawings which describe five years of badly paid jobs, drama and heartbreak, friendships, being mother to a dog and vegan cuisine (including recipes!). Over the course of the book we can see the improvement in Georges' illustrations, which look as though they are torn straight out of a sketchbook. What makes this comic so special is how it makes the reader think of how magical the most simplest of actions and ordinary moments can be; such as riding a bike or even having your daily coffee. An unpretentious and endearing example of life as art." "On the surface, this zine anthology is a huge collection of illustrated journal entries spanning six years of Nicole’s life. She writes about her work, her lovers, places she’s lived, funny things her friends have said, and her beloved dog, Beija. But there’s something deeper here; there’s a theme of almost childlike sincerity. The way she draws herself in a hat with bear ears and her friends surrounded by little hearts, the way she doesn’t gloss over embarrassing or unflattering situations, and the fact that she expresses her feelings when she’s going through rough times instead of pretending it’s no big deal make this zine very down to earth and relatable." "This collection of Georges’ illustrated journal makes me feel good about life. The matter of fact way she deals with every day happenstance makes me feel better about issues that I usually feel awkward about. It’s bizarrely nostalgic for me in a way, because she moved out to Portland, OR to live around the same year I did it appears. 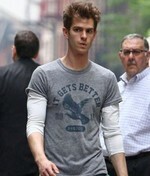 That’s not the main reason I like it though. I think this artist just has a great outlook on life that for me is contagious." I started reading it at a record store/distro and now I'm going to have to buy it because I got so involved in it within the first few pages! Kniqole is awesome. I loved this book so much that I had to ration it and stop reading for a while so I wouldn't finish it right away. i read it after the election and it made me feel a lot better. his beautiful anthology compiles Nicole's first 8 issues of her self-published zine plus some new material. 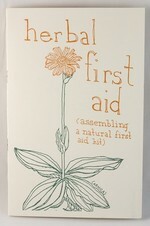 Nicole is a beloved fixture in the Portland zine scene, and she does that scene proud in this book. You really get a feel for her life in PDX; her jobs, friends, dogs, her many cups of coffee per day. Her drawings seem ripped right from her sketchbooks, which gives them a real spontaneity. She draws herself like a little girl or inner child version of herself, perhaps that's why I found her comics so innocent and endearing. Many of us can relate to wanting to settle down but feeling unsettled about it. I like Nicole's stories because she's searching, at times with hesitancy, at times with blind bravery, she explores and tries to live the way that feels right to her. There are many obstacles to this, hence, comics for us to read and learn from. . . .
For years, Nicole J Georges has recorded her thoughts and adventures in beautifully illustrated journal entries and published them in her zine Invincible Summer. Now, the first 8 issues of this beloved publication (including many, new, rare and out of print pages) are collected in one book. Overflowing with personality and wit, drama and art, this anthology presents 5 years of Nicole's low paying jobs, heartbreaking romances, inspiring friendships, vegan recipes, dog motherhood, and endless trips to the corner coffeeshop. 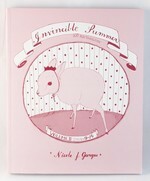 If the Narwhal is the unicorn of the sea, then Invincible Summer is the unicorn of zines. Horny and crass, like a drunken sailor, Nicole Georges draws and writes as eloquently as the reciting of a dirty limerick. She's as funny and wrong as she is rhythmic and catchy. With her trusty companion Bieja the dog, Georges has set out on a journey across Portland and beyond to help animal kind, to gossip and taunt, to sew and discover, and to rock the karaoke mic with her salty salty moves. I love Invincible Summer so much. I suggest reading it on the porch in the rain, with a small menagerie, and a really really strong cup of coffee. Hooray! Upon opening I knew I would fall in love with this book. There is something about Nicole's style that feels like a good friend offering their travel journal to you. Invincible Summer reads like a diary, the kind where the keeper draws feverishly, tapes photographs in, and pastes bits and pieces with a wired and lilty passion. 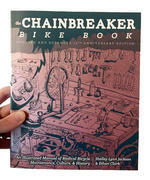 It is the quintessential inked and animated personal zine, something to dive nose first into and get lost. Nicole has exposed an artful life in all it's glory and agony, and we are lucky enouigh to catch a glimpse. It's kind of weird, yet amusing all at once (the E.T. drawing is probably the best). My favorite parts tend to be her experiences working at the Farm Sanctuary in California on a couple of occasions. Cool stuff. It kept me well-entertained. This is a book that is meant to be read on a hot summers evening, on a patio, porch or balcony, with a big mug of coffee in hand. Invincible Summer will sometimes make you giggle out loud, or make you feel anger towards society's treatment of our four legged friends, but this book will definitely leave you wanting more of her continuing legacy of coffee, dogs and romance. 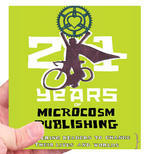 "I wish I had the good fortune to love every zine as much as I love Invincible Summer ... For me, reading the first Invincible Summer anthology invoked feelings similair to sitting on the roof with a good friend, excitedly passing notes in class, and wide eyed coffee jittered conversations. I liked, loved it, want some more of it. . . . Did I mention the occasional vegan recipes which showed up in the pages?" Wow, this is a fine collection of the first eight issues of Nicole Georges’ zine. 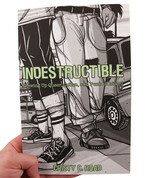 Invincible Summer contains a unique mixture of autobio comix and journal entries, vegan recipes, and craft tips. Nicole’s drawing style is fun and expressive, and she tells compelling stories. The book includes new, rare, and out-of-print pages, thus making it a necessity even for those who’ve been reading from issue one. And for new readers, it will be a rare treat getting to read all eight issues straight through. You can’t go wrong by picking up this book. 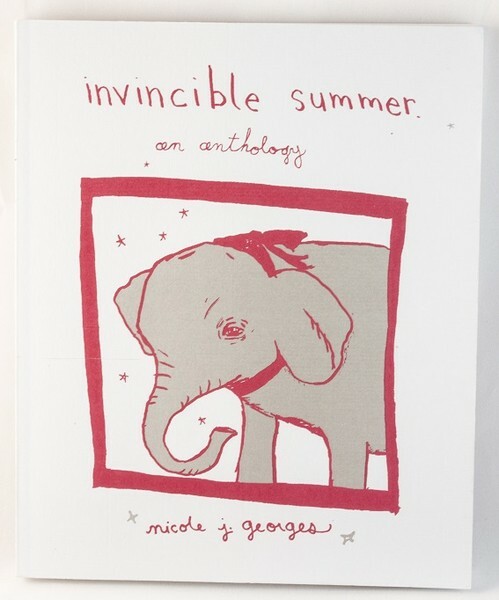 "Invincible Summer is a compilation of several of Nicole J. George's journal entries that were incorporated into zines and are now in the form of this truly wonderful book. Inside you will find the first 8 issues of Nicole J. George's quirky and emotionally charged autobiographical stories, that are perfect for the punk rock soul or the everyday individual who is searching for their path in life. Coffee, dogs and romance will always be found cleverly knitted into many of the well written and beautifully illustrated tales. 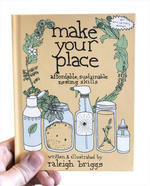 Being a cookbook geek and junkie I thoroughly enjoyed the Vegan recipes intertwined within her stories. Also included amongst her illustrations are photos of the rescued animals she met during her internship at the Animal Sanctuary in California. Nicole's adventures at the animal sanctuary will definitely pull at your heart strings. This is a book that is meant to be read on a hot summers evening, on a patio, porch or balcony, with a big mug of coffee in hand. Invincible Summer will sometimes make you giggle out loud, or make you feel anger towards society's treatment of our four legged friends, but this book will definitely leave you wanting more of her continuing legacy of coffee, dogs and romance." Log in to get emails when Nicole Georges has something new.